I started out with a sheet of SU's very vanilla cardstock. I stamped the hero arts houndstooth background in crumb cake ink, and then went to town with my distress inks. I stamped a faint script image over the top of that. I also distressed and sponged my white doily into the warm espresso color of the inspiration photo. The library card image was also distressed, and the lady silhouette was stamped off onto scrap paper. The sentiment and silhouette are from PTI's "iconic images" set. I added 3 buttons for balance, and to reinforce the challenge colors. my lovely nest, fall edition. I *heart* using my craft supplies to beautify my space. A little spray-paint on pumpkins, felt leaves all sewn together, and a quick embroidery hoop - some subtle decor for the season of thanks. The leaves were cut with an SU die. On the embroidery hoop, the white panel was cut with PTI's half and half die. The letters are by lawn fawn (quinn's abcs), and colored in with copics. Do you beautify your nest for each holiday season? How elaborate (or not) are your decorations? 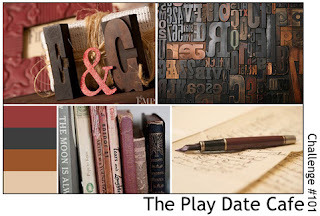 The MIM challenge this week is to create your own chipboard accents - so fun! Since their steel dies can only cut the thickness of a thin piece of cardboard at a time, the trick is to glue 5-6 layers together to get a really thick accent for your project. The top layer should be in the cardstock color of your choice and/or stamped with the coordinating image. And voila! A homemade chipboard accent. 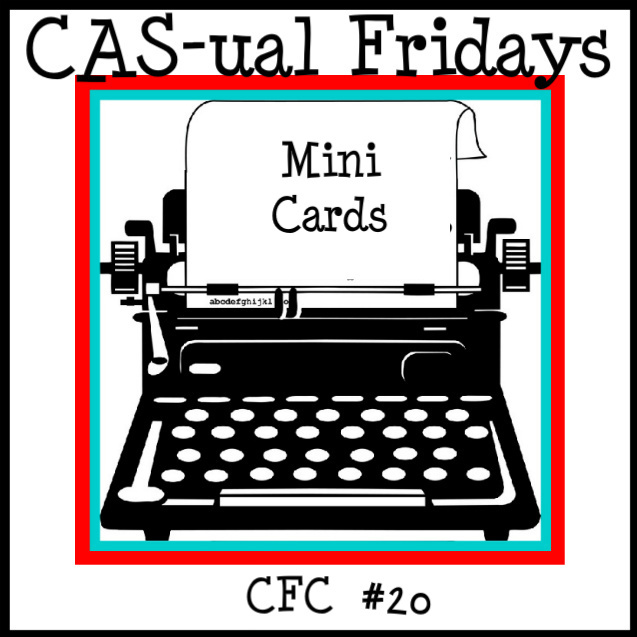 I'm also entering this card into the current CAS-fridays challenge: to use at least 3 shades of a monochromatic color, and then add the color brown as well. I've used 2 PTI sets to create this card: "postmarks", and "tag-it's #2". I started out with a kraft base, and added a vintage cream mat on top. The postage border was stamped onto the cream layer in SU's real red ink. The air-mail image in the top left corner was first stamped off on a scratch paper so that it would be less vibrant. Same goes for the wavy cancellation lines. Beside the wavy lines, I stamped the tag-it's frame in a rose-red, to provide a frame for my chunky postage stamps. The sentiment was stamped in the same brown distress ink, and stamped again over-top without re-inking. In person, it gives the softest shadow-effect. Even though our little family is complete, I still get giddy with excitement whenever a new pregnancy is announced... and when the babe-to-be is your little sister's? We're all over-the-moon. To begin, I masked the outside of the polaroid image, and stamped a grid-pattern on the inside. I also layered the hero arts' "life of the party dots" background stamp in there and then rubbed some antique linen over everything. 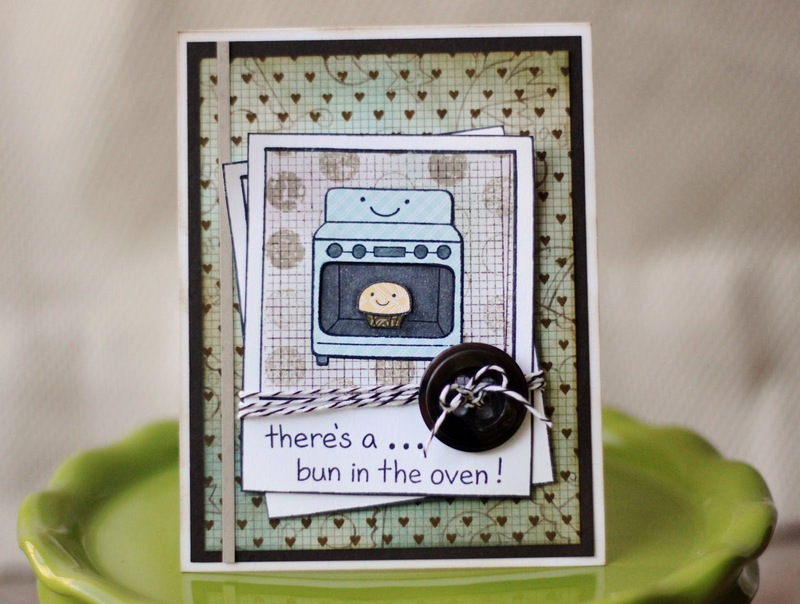 The oven and "bun" images were paper-pieced (I stamped them on patterned paper, cut them out, and glue it all together). The only coloring I did was inside the oven and on the knobs. The mat with all the hearts started out as a piece of white cardstock. I stamped the same grid-pattern over the whole area, and then layered different images from "plus one" scattered all over. If you look closely, you might be able to pick out the stork, or the mobile images! There's a baby carriage and a rattle, too (I should be giving out points or something for whoever could spot them all, ha ha!) I also stamped PTI's background basics: hearts over the entire mat, and layered blue and brown distress inks over-top so that it better blended with my main image. a handmade Christmas, part 1. This sweet, little guy is for my sweet, little guy. For the record (and to ease my husband's conscious), if I didn't also have 2 girls who would be opening their dolls on Christmas morning, I probably wouldn't be making one for Thomas... so let's just call it a "sidekick" or "little buddy." Ha! Can you spot the PTI die I used? The tiny elephant is an ode to the other, larger elephant in the room. 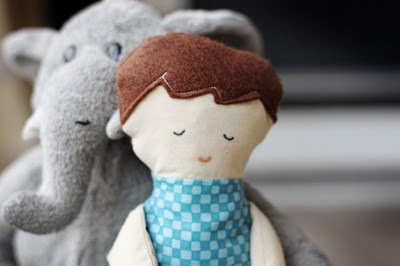 That grey elephant has been in our family for all of Thomas' little life. The four years of wear and tear are starting to show, but I'm hoping Thomas will love this new friend just as well. They'll be bffs in no time! awwww! So now you want to make your own? It wasn't so hard! Here's a link to the Martha Stewart site where you'll find a tutorial and a free template: black apple doll. I used the same colors found in the stripes on the floor, but curved them... and left lots of white space all around. if I show you another Christmas card? It's been about a week, right? I've shown you other stuff, right? This weekend, I'm going to start some Christmas crafting. I want to make each of the children a "black apple doll." I found the template on Martha Stewart's website, and it looks easy enough (famous last words, right?) The problem is that I can't really sew. I know I've fooled you with all of the card-stitching I've been doing, but apart from sewing on cards, and making the occasional simple throw-pillow.... I just hope this isn't a case of ambition far-outweighing skill level :) Are you planning any homemade gifts for the holidays? Care to share? 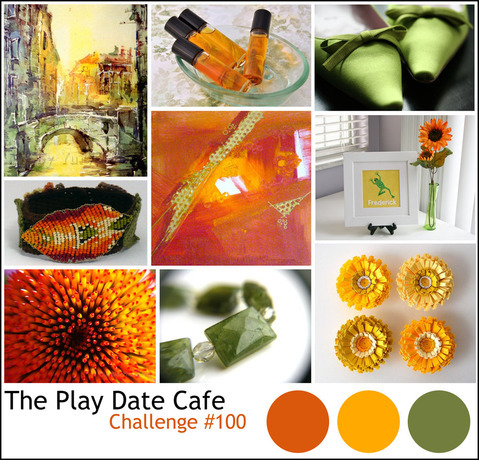 I thought the Play date colors were perfect for my masculine card! I added grey as a neutral, and just a hint of blue in a text-y sky background. I really wanted to let those colors stand as the focal point of my card! Here's a closer-up view of the text background: I stamped "enjoy the ride" (a sentiment from LF's "admit one") repeatedly using tumbled glass distress ink (which I first stamped off onto a scrap paper so that it would be very faint in the background). The ferris wheel (from the same set), was stamped in memento black ink and colored in with copics. My green "grass" was stamped in versamark ink with an image from "schoolhouse backdrops" and given a stitched-treatment to frame it out. 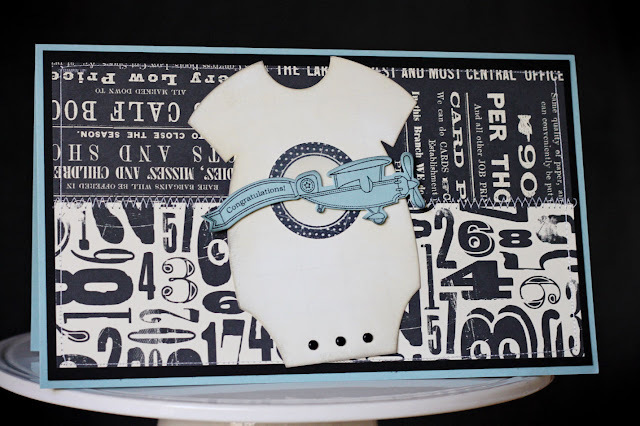 fly away - large baby card. The hubs asked me to create a card that some 30 people could sign in congratulations of his boss' new baby boy. It measures 6x10inches - you can tell how big by the size of that onesie shape on the front! How can you not put on a happy face with all of those smiling faces staring back at you? Impossible! ps. I masked the umbrella before stamping the text background and hero arts envelope pattern background stamp over top. The umbrella and raindrops were colored in with copic markers. I grabbed some twill tape and stamped "home" on the side, from PTI's "wreath for all seasons". To finish off, here's a picture of my little pumpkin amid a bunch of pumpkins :) A little taste of the beautiful, but chilly, fall day that inspired today's card. I used versamark ink to create the different tone-on-tone backgrounds, and then swiped white ink around the edges to tone it all down just a bit. CAS-ually adding love to lunchboxes. I'm one of those geeky moms who likes to put little love-notes into my kids' lunchboxes. I don't do it all the time, but it's become so normal for my kids to see a quirky-and-punny-stamped-note in their box that I hear about it when I forget. I love that. I have to admit, though, that I'm usually scrambling to create something at night - after their lunches have been made for the next morning. 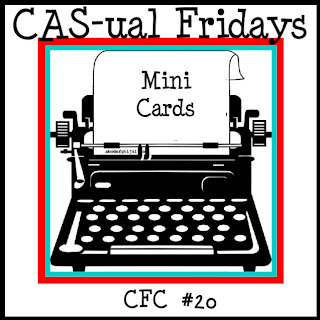 This week's CAS-ual fridays challenge is to create a small card. I took the challenge and ran with it - I now have 5 bitty cards to pop into my daughter's lunchbox. Love-notes for the week? done and done. Each of these cards are 2.5x3.5inches. The front of each card uses a notebook page die by PTI. To unify the cards, I stamped a focal image and colored it with the same 4 copic markers, then masked that image and stamped the notebook lines from PTI's "it's official" in SU's pool party ink. "For my doodlebug" uses a caterpillar image from "way to go, kiddo!" (PTI) and a sentiment from the same set. Also using "baby button bits", I stamped the cupcake and grabbed a "paper smooches" heart to fill in the gap where the button would go. The sentiment is from PTI's "signature series: cupcake" set. The kite and sentiment are from PTI's "up up & away" set. I've saved my favorite for last. The lamp is from PTI's "on my couch" set. 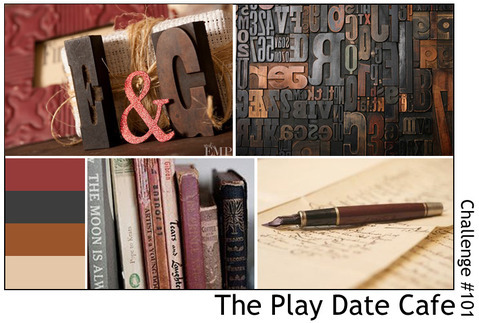 I created the greeting using some creative masking of different words from the set, as well as lawn fawn alpha sets. Aren't they the sweetest, little hand-holding, stripey-muff-wearing snowmen? I just got this new lawn fawn set and had to play. 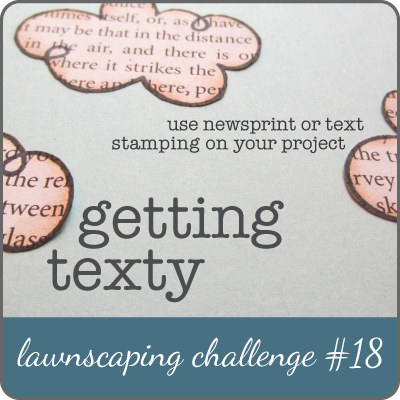 I started out with a kraft mat and stamped images from the set using memento black ink. Dipping a small sponge dauber into fresh snow ink (PTI), I highlighted some of the snowflakes and the little snowy bodies. All of their accessories were paper-pieced on top. I added some glitter to a few snowflakes as well, by way of a glue pen and fine glitter. The edged of my kraft mat were roughed up to add more texture, and it is adhered to a white cardstock card-base. The sentiment is a computer-generated one - I thought it fit the bill! 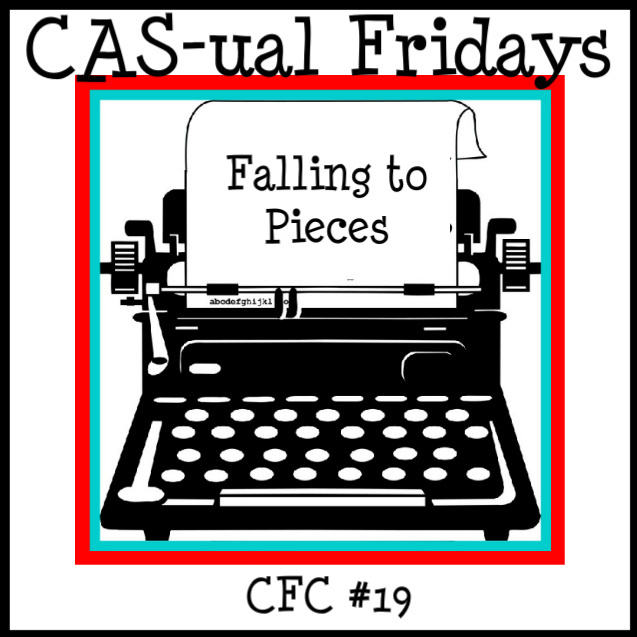 So how do you go from lawn-mower-accident to entering a CAS-ual Fridays challenge? "Aw, nuts!" As in, "aw, nuts! sorry to hear that you got your foot caught in a whirring blade and are now holed-up in the hospital..."
I started out with a kraft base, which I embossed with PTI's woodgrain impression plate. 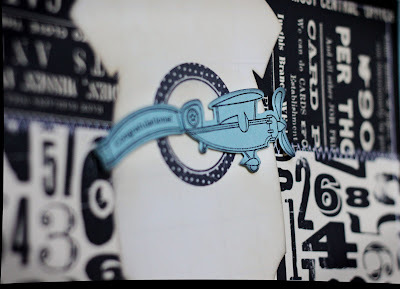 The strip of patterned paper was cut with a PTI half & half die - love those! The acorn is from Paper Smooches' "falling for you" set, and I created my own greeting with lawn fawn's "smitty's abcs". All of the patterned paper is from SU. lawnscaping blog hop - celebrate the holidays!